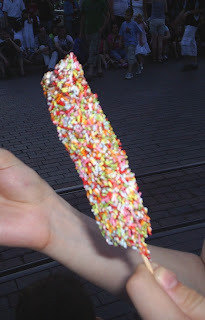 Mandas Disney Blog: Chocolate Coated Marshmallow Sticks from Disneyland Paris! Chocolate Coated Marshmallow Sticks from Disneyland Paris! It's not the best pic but you get the idea! :P They come with just chocolate coating (Chocolat), Chocolate with sprinkles (Chocolat Vermicelles) or Chocolate with coconut (Chocolat noix de coco) and sell for around 2 Euros each :) My favourite is the one with chocolate and sprinkles! With the long Summer nights officially here - I thought I would try to re-create this really simple treat at home to munch on while I watch the Fantillusion parade on YouTube in my garden in a desperate attempt to imagine I'm in Disneyland Paris on a warm summer night :) lol! Then I melted a couple of packs of plain cooking chocolate in a jug in the mircowave for 30 seconds at a time, mixing until it was all melted. The I added a couple of tablespoons of olive oil to make the chocolate thinner - this also stops it setting so fast :) Time to start coating! And here's how all the sticks turned out! I even made a stripey one! :P My favourite was the chocolate sprinkles one by far! :) It was less crunchy than the others - something I'll remember when choosing sprinkles if I make these again! An important tip is to keep them in the fridge because the chocolate can melt quite easily! It's amazing how something so simple can take me right back to Summer in Disneyland Paris ... now if you'll excuse me ... I'm off to watch the Fantillusion parade in my back garden! lol! Happy Friday everyone! Let me know if you try these out! :) Have an awesome weekend! Can you believe that I have never seen these in DLP? Now I am going to have to see them for myself. Manda, Manda, Manda, what are you trying to do to me so early in the morning? I'll never make it to lunch now, lol!! These look so yummy and soo fun to make! The kids and I would have so much fun with these! OMG! That looks so delicious right now!! Oh my! Those marshmellow sticks look DELISH!!!! Great job, Manda! Awesome! These look so neat! I think I'm going to make these as a surprise for Hubby on our next trip. Then I will present them to him in the car, as treats along the way. Were they very messy to eat?